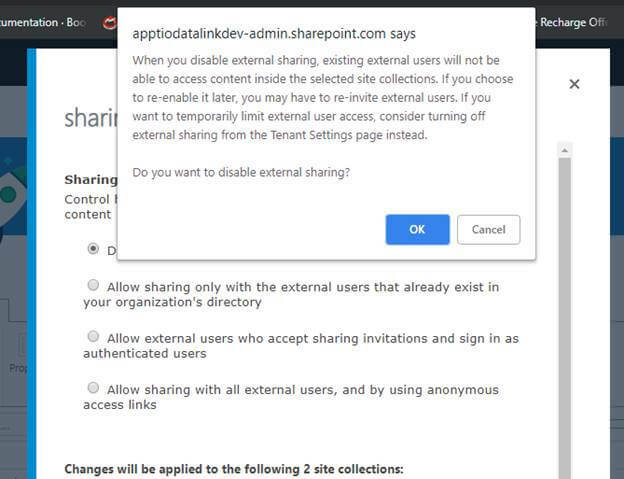 In this article, I will discuss the steps for disabling the sharing of a document with external users from O365 organizations using SharePoint Admin Center. By default, SharePoint provides the option to share documents with external users. Some of the customers, however, do not want to share documents with external users. One of our customers asked us to stop the external sharing for a particular site collection. We followed the below steps to stop the external sharing of the document. 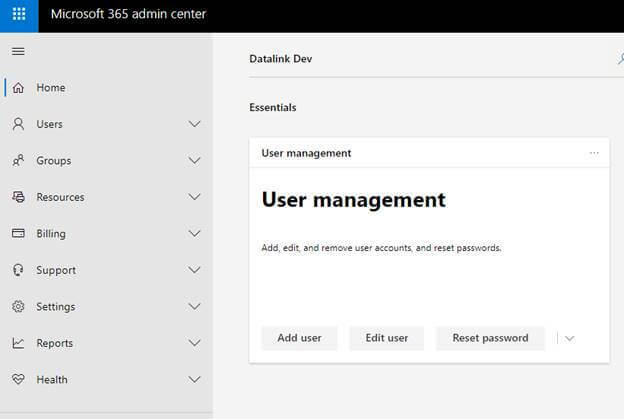 Open your O365 Admin Center. Select the "SharePoint" option from left navigation, as shown below. You will be navigated to a list of site collections. Here, you can select the desired site collection for which you want to stop sharing with external users. Then, select the "Sharing" option from the ribbon tab container; you will get a pop-up box. 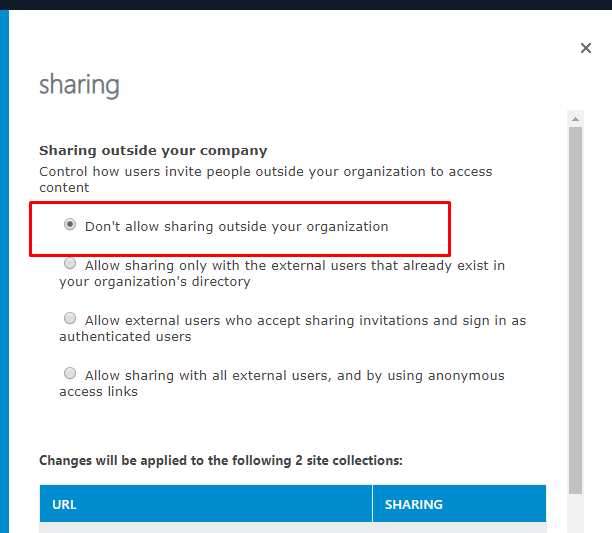 On the pop-up window, select “Don’t allow sharing outside your organization”. When you select that option, you will get an alert message as shown below. Click “OK” if you want to proceed with the disabling option. Click "Save" to update the changes. Hereafter, you won't be able to share the documents with external users from the disabled site collections. When trying to share the document with external users from the disabled site collection, you will receive the following message. “Your organization policies don’t allow you to share with these users. 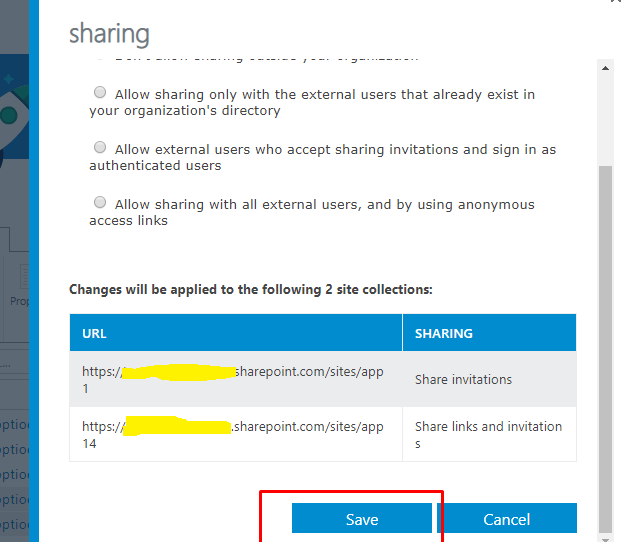 Go to external sharing in the office 365 admin center to enable it”. So far, we saw the steps to disable external sharing from a particular site collection. Now, we are going to see the steps to disable from the organization. Click "SharePoint" from left navigation. 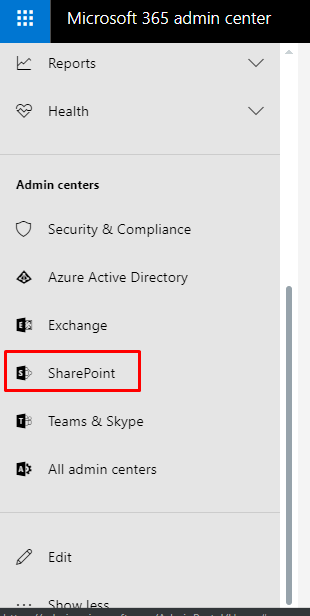 On the SharePoint Admin Center, select the Sharing option from the left menu. Then, select the “Don't allow sharing outside your organization” radio button from Sharing outside organization category. Click the “OK” button to save changes. Finally, you have disabled external sharing of the documents at the organization level from your tenant. If you want to enable, just select the “Allow sharing option“ from the Admin center. 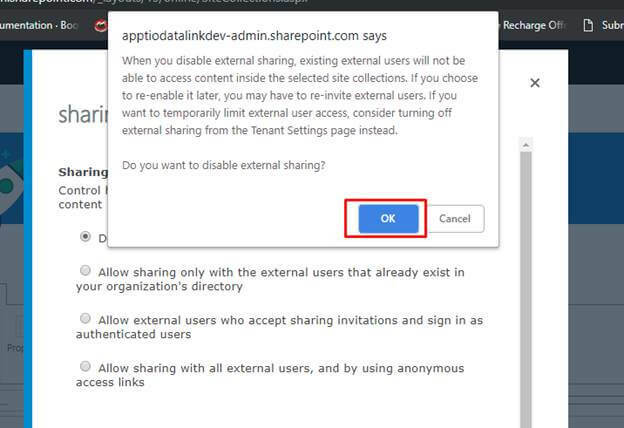 In this article, we have explored how to disable the external sharing from the organization and stop sharing the document from a particular site collection using SharePoint Admin Center. Please provide the comments or feedback you have after reading this article. Happy learning.